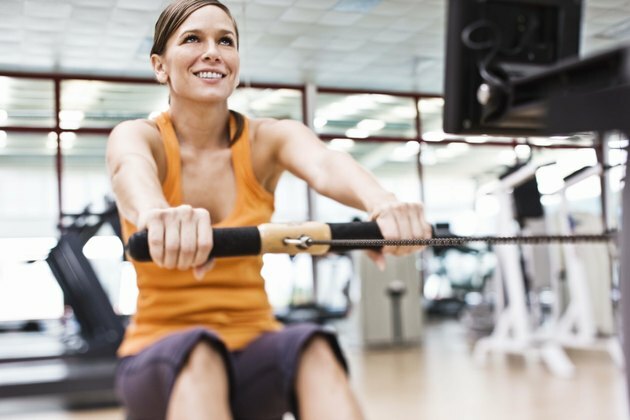 A rowing fitness machine allows for a low-impact workout. It not only offers an intense cardiovascular workout, but also works to target and tone numerous muscles. According to the American College of Sports Medicine (ACSM), rowing is a mode of exercise that involves both the upper- and lower-body muscles. A regular rowing workout can help develop muscular strength and endurance in some of the major muscles of the body. The muscles of the back are largely targeted by a rowing machine. Specifically, the trapezius, rhomboids and latissimus dorsi muscles. The trapezius and rhomboids act together to stabilize and retract, or pull together, the shoulder blades. The latissimus dorsi is a powerful muscle that plays an important role in bringing the arm down in a power stroke, as seen in swimming and rowing. The arm region is used extensively while rowing. Your posterior deltoid muscles are activated and work in unison with the back muscles to complete the rowing motion of the upper body. The biceps and forearms are also targeted with each flexion of the arm. If you are using proper form while rowing, then your core is engaged the entire workout. Your abdominal muscles are crucial for the powerful movements required by the rowing machine and are also a critical component in coordinating your upper and lower body to complete the movement in a fluid motion. The quadriceps and hamstring muscles of the legs are in constant motion during a rowing workout. Your legs work to propel your body backward in the pulling phase of the movement. After a workout on a rowing machine, you can be sure that your legs have been thoroughly utilized.